Courses for hobbyists with instruction and training, or simply holiday studio space for artists, with instruction on hand if/when required. Learn painting techniques in the UK, Europe, the USA and Worldwide. See the sub-categories for specialisations within this category. Offering a wide range of creative classes including Argentine tango, painting, stone carving, Italian cooking and culinary travels in Tuscany and Umbria. Classes take place at Villa La Rogaia an outstanding wheelchair friendly country house in Umbria with pool. They serve delicious food with products from their organic farm. Painting courses and holidays in enchanting Maramures, in Northern Transylvania. These courses are run by established British artists and tutors and cater for painters at all levels; numbers are limited to maximise individual tuition. Professional artists looking for an artist retreat are welcome to join to do their own work. A magical place to sketch, paint and relax in SW Spain. Stay in a country finca and choose 4 or 7 nights landscape or landscape/townscape art courses in unspoilt Extremadura. Or townscape course in one of the finest white villages of Andalucia. All accommodation, all meals, airport transfers included. artbreak™ is an unequalled active-arts and adventure-learning vacation to renew your mind, heart, and spirit, midst the most beautiful city in Europe. artbreak™ gives you intimate access to Prague's brilliant artistic world via hands-on art workshops, gallery tours, plus the best of Prague's music, theatre and dance performances. Unforgettable painting holidays in Italy and France, in small groups (5 to 10). Destinations include: Venice, Capri, Amalfi-Pompeii, Cinque Terre, Tuscany, Florence, Sicily, Rome, South of France (French Riviera), Chateaux, Brittany and Paris. Holidays include plein air tutoring with materials, equipment and comfortable accommodation in the heart of the art. Cookery, arts or leisure holidays in high-class private property near Carcassonne with great French cuisine and wines. Recommended in "100 World's Best Vacations" book. Eight-bedroomed accommodation has pool, tennis and boules. Tutored courses include painting, books, creative writing, songwriting, movie-making and Gastro Academy with top French chefs. Summer school program offering high school students (13-18) the opportunity to combine learning, creative enrichment and action-packed adventure in the amazing, historic and picturesque university towns of St Andrews, Cambridge and Yale. A three week program welcoming students from over 60 nationalities (each nationality limited to 10% to guarantee a truly international experience). A course catering for mixed groups of beginners, people wishing to re-awaken their artistic instincts, or more advanced artist who'd like to develop their skills. The course explores themes such as still life, portraits, landscape and villagescape – carried out using your preferred medium, be it drawing, painting or using mixed media. The course is held at a stylish, 200-year-old Carcassonne farmhouse, located in the stunning rural environment of SW France. 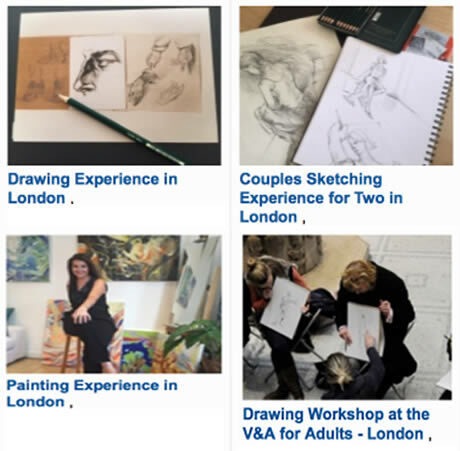 A range of London based day activities and experience days in painting, drawing and sketching techniques. Includes a one-on-one private painting workshop experience with a practising professional artist, suitable for all levels of experience and teaching a variety of techniques. The experience also includes a champagne lunch. This section lists holidays, vacations and residential multi-day courses and workshops for hobbyists and amateur artists. This includes painting courses with instruction and training, or simply holiday studio space for artists, with instruction on hand if/when required. It covers the full range of painting mediums, from pastels, coloured pencil, charcoal, pen and ink to watercolour paints, gouache, acrylics and oil paints. We have separate sections covering life drawing/painting and mixed media, and a host of other specific art related categories such as art appreciation or sculpture. The travel-quest painting holidays section is for listing holidays, vacations and residential multi-day courses and workshops in the UK, Europe, the USA and Worldwide.